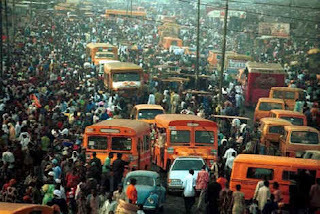 Nothing in the world compares to the ubiquitous Lagos yellow bus popularly known as Molue. I didn’t get to see a Molue until I was twelve. Even then I did not get to enter one until a few years later. The Molue is like a house built on the chassis of a Mercedes 911 truck, a deathly home. It is built to carry the maximum number of people possible (44 sitting and 99 standing according to Fela) as it dashes back and forth along the 3rd Mainland Bridge. It has become an iconic landmark on Lagos roads, it is deliberately menacing to other road users. It follows no speed limit. It is bold and brash. It is big and ugly. It is dirty, yellow and should disappear. It carries an unwilling but option-less human cargo, stripped of their humanity and forsaken to the vagaries of poverty. Molues are unrepentantly and irrepressibly overbearing. They usually have hair-splitting horns used at will to dissuade and harass other road users. They have made up their own rules which is ‘there are no rules’. As a lion is king of the jungle, an oncoming Molue is unquestionably the king of the road. It is really a matter of choice to decide which is the real wonder - Molue or the Molue driver. It drives so fast for a big moving truck as if it is invincible. Once inside a Molue, your life is mortgaged as anything could happen. If you never acknowledged it before, your life is in God’s hands once you stepped inside the Molue. Inside the bus, Molue has a life of its own that is as interesting as staggeringly sobering. All forms of items are sold inside the bus including blood-red drugs that is claimed to solve any problem from stomach upset to curing HIV. You will also find courageous people who will brave the many eyes fixed on them as they preach the gospel. My sister once saw a man carrying life snakes inside a Molue. Molue lumbers everyone together, the smartly dressed man on his way to the office and the iya-oloja (market woman). It carries the attractive young woman and the ageing old man that thinks he is good enough to be her suitor. Because of the way people are packed like sardines in a tin and the unforgiving Lagos tropical heat, the Molue can test your digestive system as various human smells join up in a deliberate attempt to make you want to puke. Thankfully the current Lagos State Governor, Babatunde Fashola is slowly phasing them out. Molue suffers from 'impatientialisis'. It is always in a hurry as if non-movement will collapse its engine. Most users have therefore learnt the art of hitching and alighting from a moving Molue with perfection. When I did get to hitch a ride on a Molue in the mid eighties, I learnt to my cost that jumping off a moving Molue was no child's play. I had seen many people do it and assumed it was easy. I later realised that to keep stable, you jump and run. Suffice it to say I didn't, and found myself flat on the hard tarmac of Legico Bus Stop on Ahmadu Bellow Way in Victoria Island. I lived. PostcardfromLagos. I had a similar experience while alighting from a molue in the early 90s. I was to drop off at Brown Street (iyana Brown) in oshodi when the molue took me past my stop. I then shouted'owa o, owa o' which means i've got to my detination. Of course i had to jump down and instead of running forward, i stood.I found myself flat on the road with terrible brusies to show 4 it. a crowd of sympathisers surrounded me and 1 or 2 of them gave a lesson on 'how to jump from a moving molue'. Molue... the face of lagos. its a tourist delight n a wonder indeed. Im so thrilled by the comic description of the Molue experience. All you said is true and I cant leave anything out. Thank God for BRT!! What a better way to refresh one of the OLD GLORIES of Lagos. And a way of revealing the past to the present generation. hahaha - wait until you are one of the deserving old men that think themselves to be suitors .. The truth is, these men may indeed be good suitors, as they may have proven their value during the years.